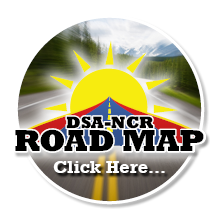 Welcome to the DSA-NCR Road Map! The Roadmap is a web-based resource guide for families, caregivers, and individuals with Down syndrome. Designed as a one-stop resource for information, it is meant to support families looking for information about Down syndrome and about local resources and programs for their families. The Roadmap is easily searchable, and easy to use! Simply click here to browse the folders and/or use the search function to find what you are looking for!